“And now I invite Chris and Brook to seal the vows they have made to each other with a kiss”. 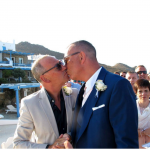 I love this moment in a wedding ceremony where the couple come close for their first kiss to celebrate what they mean to each other. Usually they just put their arms out towards each other, hug and kiss in a really natural way and everyone applauds. Occasionally as the wedding day comes closer and a couple are looking at the outline of their ceremony, one or both of them will express their nervousness about this very public display of affection. So here are a few tips for your first kiss. Don’t rush towards each other – that is the road to banged heads, lost veils, smudged lipstick, squashed toes and even falling over onto the floor. Move slowly towards each other, focusing on your partner and put your arms around each other – as if you really want to be in there. Every couple will have their own feelings about how passionate they feel comfortable being in front of their guests. So don’t feel that you have to hold back if you want a long and passionate first kiss (although be prepared for some bright spark shouting “get a room”). On the other hand if kissing in public makes you feel uncomfortable just hold each other close with your lips together and eyes closed and save the hot passion for later. Be true to yourselves. 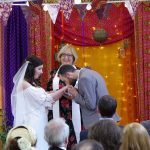 I love surprises in a wedding ceremony – especially where one of the couple has added something in as a gift to the other. 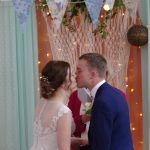 However, if you might have different ideas about your first kiss in public as a married couple then this probably isn’t the best place to have a surprise with you raised above the guests on a zip wire and one of you holding on for dear life. Especially if one of you is a little shy it can be helpful to know what is coming for your first kiss – a loving short kiss or being swept off your feet. If you or your partner do really feel uncomfortable with that first kiss in public then leave it out. It’s your day so do it your way. You might be happy to hug or do double kisses on the cheek or kiss each other’s hands or just squeeze each other’s hands. Do what feels right for you. 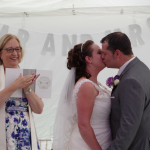 But don’t forget to tell your Officiant if you have decided not to kiss in case they announce it – awkward! The first kiss is special but however it goes (or doesn’t!) it is just a moment in your special day which is all about showing your love to each other. Just enjoy it! 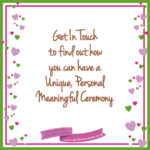 If you want to talk about anything Wedding Ceremony or to arrange a unique, personal meaningful ceremony – get in touch! 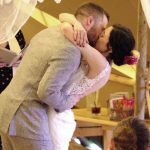 ← Renewing your wedding vows – why and how!